Investment Objective: To seek long-term capital appreciation with an emphasis on capital preservation. Investment Strategy: The Fund employs an allocation strategy, moving between equities, fixed income and cash depending on market factors. Equity investments are selected from an index of companies the investment team identifies as Knowledge Leaders. A Knowledge Leaders Strategy: The strategy seeks to transform the Knowledge Effect into portfolio alpha. The investment process aims to capture this market inefficiency using a proprietary methodology which capitalizes corporate knowledge investments, measures firm performance on a knowledge-adjusted basis, and selects investments in Knowledge Leader companies on the basis of knowledge intensity. 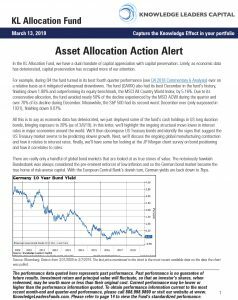 As of 3/31/2019, the 1-year, 5-year and since inception annualized total returns for the KL Allocation Fund Advisor Class were -5.46%, 3.63% and 6.46% and Institutional Class were -5.25%, 3.87% and 6.75%, respectively. The MSCI All Country World Index’s 1-year, 5-year and since inception annualized total return as of 3/31/2019 were 2.60%, 6.45% and 8.40%. The total annual operating expenses of the Fund are 1.49% and 1.24% for the Advisor and Institutional Classes, respectively. The inception date for the KL Allocation Fund is 09/30/10. The Advisor has contractually agreed to waive its fees and/or pay for operating expenses of the Fund to ensure that the total annual fund operating expenses (excluding any taxes, leverage interest, brokerage commissions, dividend and interest expenses on short sales, acquired fund fees and expenses (as determined in accordance with Form N-1A), expenses incurred in connection with any merger or reorganization, and extraordinary expenses such as litigation expenses) do not exceed 1.50% and 1.25% of the average daily net assets of Advisory Class and Institutional Class shares of the Fund, respectively. This agreement is in effect until December 31, 2019, and it may be terminated before that date only by the Trust’s Board of Trustees. Oakland A’s Coach Billy Beane’s genius was transforming professional baseball from a Winner’s Game, in which the actions of a few superstars dictated the outcome, to a Loser’s Game, where the team that made the fewest errors won. Legendary investor Charles Ellis has declared that active money management also has turned from a Winner’s Game to a Loser’s Game. Today, when over 90% of active managers are underperforming*, success may be as much about selling the wrong stocks as buying the right ones. In the KL Allocation Fund, we apply a Moneyball approach: seeking to outperform by making fewer mistakes than the overall market. Of the 14 5%+ market drawdowns since inception of the fund, the fund has outperformed in all 14 (as of 12/31/18). By striving never to own securities that experience a major drawdown, we aim to manage a portfolio with a very low max drawdown. Our most popular report ever was January 2018’s Moneyball Investing, Winning the Loser game. After a year of volatility and a new waterfall decline in 2018, we revisited our Moneyball analysis to explore how it stands up to new data. Download our new white paper Moneyball Investing 2019: Winning the Loser’s Game. The Knowledge Effect is the tendency of highly innovative companies to generate excess returns in the stock market. It is a market anomaly based on decades of academic research. To learn more, read our white paper, The Knowledge Effect: Excess Returns of Highly Innovative Companies. The value of the securities held by the Fund will change due to general market and economic conditions and industry perceptions. Investments in non-US issuers may involve unique risks. Currency fluctuation, adverse political, economic or social developments could undermine the value of the Fund’s investments. The securities of mid-cap companies may be subject to more abrupt or erratic market movements and may have lower trading volumes. Many of the risks with respect to foreign investments are more pronounced for investments in issuers in developing or emerging market countries. An investment in a fund that is less diversified across countries or geographic regions is generally riskier than an investment in a more geographically diversified fund. Portfolio composition will change due to ongoing management of the Fund. References to specific securities or sectors should not be construed as recommendations by the Fund, its Advisor or Distributor. The blended benchmark is comprised 60% of the MSCI All Country World Index and 40% of the Barclays US Treasury Bond Index. Percentages are allocated to equity invested. © 2019 Morningstar, Inc. All Rights Reserved. The information contained herein: (1) is proprietary to Morningstar; (2) may not be copied or distributed; and (3) is not warranted to be accurate, complete, or timely. Neither Morningstar nor its content providers are responsible for any damages or losses arising from any use of this information. Past performance is no guarantee of future results. The Morningstar RatingTM for funds, or “star rating”, is calculated for managed products (including mutual funds, variable annuity and variable life subaccounts, exchange-traded funds, closed-end funds, and separate accounts) with at least a three-year history. Exchange-traded funds and open-ended mutual funds are considered a single population for comparative purposes. It is calculated based on a Morningstar Risk-Adjusted Return measure that accounts for variation in a managed product’s monthly excess performance, placing more emphasis on downward variations and rewarding consistent performance. The Morningstar Rating does not include any adjustment for sales loads. The top 10% of products in each product category receive 5 stars, the next 22.5% receive 4 stars, the next 35% receive 3 stars, the next 22.5% receive 2 stars, and the bottom 10% receive 1 star. The Overall Morningstar Rating for a managed product is derived from a weighted average of the performance figures associated with its three-, five-, and 10-year (if applicable) Morningstar Rating metrics. The weights are: 100% three-year rating for 36-59 months of total returns, 60% five-year rating/40% three-year rating for 60-119 months of total returns, and 50% 10-year rating/30% five-year rating/20% three-year rating for 120 or more months of total returns. While the 10-year overall star rating formula seems to give the most weight to the 10-year period, the most recent three-year period actually has the greatest impact because it is included in all three rating periods. * The Morningstar percentile ranking is based on the fund’s total return relative to all funds that have the same category for the same time period. The KL Allocation Fund (GAVIX) was in the 95 percentile for the 1 year period among 480 peers in the Morningstar World Allocation Category; 98% in the 3 year period among 438 peers, and 32% in the 5 year period among 397 peers. The Morningstar percentile ranking is based on the fund’s alpha relative to all funds that have the same category for the same time period. The KL Allocation Fund (GAVIX) was in the 95 percentile for the 1 year period among 480 peers in the Morningstar World Allocation Category; 97% in the 3 year period among 438 peers, and 16% in the 5 year period among 397 peers. The Morningstar percentile ranking is based on the fund’s beta relative to all funds that have the same category for the same time period. The KL Allocation Fund (GAVIX) was in the 14 percentile for the 1 year period among 480 peers in the Morningstar World Allocation Category; 17% in the 3 year period among 438 peers, and 17% in the 5 year period among 397 peers. The Morningstar percentile ranking is based on the fund’s max drawdown relative to all funds that have the same category for the same time period. The KL Allocation Fund (GAVIX) was in the 84 percentile for the 1 year period among 480 peers in the Morningstar World Allocation Category; 97% in the 3 year period among 438 peers, and 77% in the 5 year period among 397 peers. The Morningstar percentile ranking is based on the fund’s up/down capture ratio relative to all funds that have the same category for the same time period. The KL Allocation Fund (GAVIX) was in the 94 percentile for the 1 year period among 480 peers in the Morningstar World Allocation Category; 99% in the 3 year period among 438 peers, and 11% in the 5 year period among 397 peers.The Morningstar percentile ranking is based on the fund’s treynor ratio relative to all funds that have the same category for the same time period. The KL Allocation Fund (GAVIX) was in the 97 percentile for the 1 year period among 480 peers in the Morningstar World Allocation Category; 98% in the 3 year period among 438 peers, and 17% in the 5 year period among 397 peers. The Morningstar percentile ranking is based on the fund’s sharpe ratio relative to all funds that have the same category for the same time period. The KL Allocation Fund (GAVIX) was in the 96 percentile for the 1 year period among 480 peers in the Morningstar World Allocation Category; 98% in the 3 year period among 438 peers, and 32% in the 5 year period among 397 peers. The Morningstar percentile ranking is based on the fund’s sortino ratio relative to all funds that have the same category for the same time period. The KL Allocation Fund (GAVIX) was in the 97 percentile for the 1 year period among 480 peers in the Morningstar World Allocation Category; 98% in the 3 year period among 438 peers, and 32% in the 5 year period among 397 peers. The Morningstar percentile ranking is based on the fund’s standard deviation relative to all funds that have the same category for the same time period. The KL Allocation Fund (GAVIX) was in the 12 percentile for the 1 year period among 480 peers in the Morningstar World Allocation Category; 57% in the 3 year period among 438 peers, and 44% in the 5 year period among 397 peers. The highest (or most favorable) percentile rank is 1%, and the lowest (or least favorable) percentile rank is 100%. Rankings listed are for the period March 31, 2019. Ratings for other share classes may differ due to different performance characteristics. The Fund’s ratings reflects fee waivers in effect; in their absence, ratings may have been lower. Multiple share classes of a fund have a common portfolio but impose different expense structures.